One cannot label anyone or a handful of South African online casinos as the best because each casino has its own merits and demerits. Moreover, it depends a lot on individual player tastes. Some players prefer old-fashioned download casinos while tech-savvy players who want to play on the move prefer HTML5 online casinos that offer games from multiple providers. While some prefer slots, others prefer a table and card games or instant play games. It is, therefore, up to players to decide whether a particular online casino is the best for them. A handful of online casinos, however, are considered to be the best by a large number of players, review sites, affiliates, and industry experts. The following is a brief overview of five such online casinos. Although White Lotus Casino is based on the theme of the white lotus, it doesn't have white in its colour scheme. Instead, the casino is set against a dark backdrop and offers instant play, download, and mobile gaming services. White Lotus operates under a license issued by the Kahnawake Gaming Commission (KGC) and is powered by Real Time Gaming (RTG) software. The game portfolio is packed with RTG slots, progressives, table games, card games, and video pokers. Players need to be above the age of 18 to play for real money at White Lotus Casino, which has sound responsible gambling and privacy policies. White Lotus is a player-friendly online casino that encourages players to sign up for its mailing list to get the latest special offers and news. Also, there is an excellent support system with exhaustive getting started information, tutorials, and FAQ. If players need instant assistance, they can click on the live chat option at the bottom of the casino homepage. If they are not in a hurry, they can send an email to support@whitelotuscasino.com for a prompt response. New players are pampered with a welcome bonus of R300 free. To claim it, players have to register a new player account and input the bonus code R300NEW. 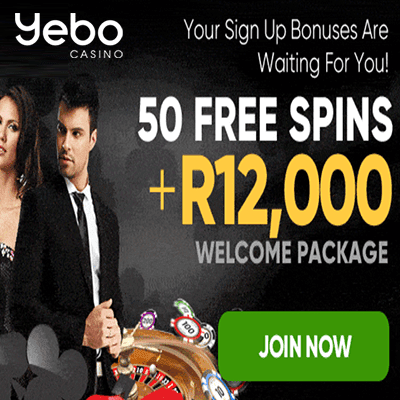 Launched in May 2014, Yebo Casino has captured the interest and affection of a large number of South African online casino players. The online casino has partnered with Real Time Gaming (RTG), a software provider known for its motto of "taking gaming seriously". Since RTG is least bothered about compliance issues and permits its licensees to operate wherever they wish, it is considered to be the ideal software provider for online casinos operating in grey areas such as South Africa. Since it is powered by RTG, Yebo Casino offers an exciting selection of slots, table games, card games, jackpot games, and video pokers. Players can contact Yebo Casino by sending an email to support@yebocasino.co.za or calling the toll-free number 0800-999-043. If you sign up at Yebo Casino right away, you will receive 50 free spins on Caesar's Empire slot. 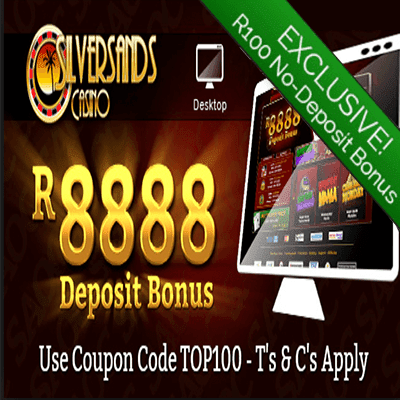 Silver Sands Casino is a highly reputed South African online casino. The gaming environment is 100% fair as the online casino has its gaming software independently tested by GLI. Moreover, it bears a certificate from Technical System Testing (TST) and another from iTech Labs. Players can view the certificates at the casino website any time they please. The online casino has partnered with the noted software provider Real Time Gaming (RTG) and operates under a license granted by the Kahnawake Gaming Commission. Players can avail of download, instant play, and mobile casino gaming services at Silver Sands Casino. Some of the biggest selling points of the online casino are new games introduced on a regular basis, a winners' club, multiplayer poker tutorials, and exciting bonuses for those who deposit through Skrill. New players will hardly face any problems at Silver Sands Casino because of its exhaustive FAQ, tutorials, getting started page, and banking information page. To contact a customer care representative, players can either click on the live chat button at the bottom of the casino website or send an email. On sign up, they will receive a free bonus of R8888. Based on the storm theme, Thunderbolt Casino went live in 2014 and quickly became popular among South African residents. The online casino offers download, instant play, and mobile gaming services, but its mobile casino was born only in 2015. The highlight of Thunderbolt Casino is its daily cashback offer of 25%. This reduces the risk of real money gaming at the online casino as players can get back some of the money they lose while playing for real money. During the weekends, players are pampered with a free cash bonus of R200 plus 40 free spins plus 2 match bonuses to choose from. Also, there is a Comp Points Program that seeks to reward players for their loyalty. As players place bets on the games at Thunderbolt Casino, they will be accompanied by the site's mascot, called Thando. He is a loveable chameleon who has arrived at Cape Town from Outeniqua Mountains. Since Thunderbolt Casino is a Real Time Gaming (RTG) casino, it is associated with the Central Disputes System (CDS), which settles players' disputes with RTG online casinos in an impartial manner. The online casino has an excellent 24/7 customer support system, which includes toll-free telephonic service on the number 0-800-980-320, email to support@thunderboltcasino.com, and live chat. If players need instant assistance, they only have to click on the Live Help tab at the bottom left of the casino website. The best time to register at Thunderbolt Casino is now because the online casino is giving away four welcome bonuses plus a free bonus of R2500. As a registered player, you can grab weekend bonuses, promotional bonuses, cashback offers, weekly specials, and VIP rewards on a regular basis. On its official website, Springbok Casino calls itself South Africa's "best" casino. Set against a pitch black background, Springbok is a brilliant online casino that gives top priority to making its customers feel comfortable. If players need instant assistance, they only have to click on the live chat button at the bottom of the casino website. Springbok is a Real Time Gaming (RTG) online casino that offers a wide range of South Africa friendly banking methods such as EcoCard, Skrill, EasyEFT, Neteller, and MasterCard. Players can also use Bitcoin to load their accounts and withdraw winnings. Springbok is as safe as a bank because it implements all the required security technologies to protect players' sensitive financial details and transactions. Springbok offers a wide range of gaming services through download, instant play, and mobile casino. Native casino gaming apps are available and players just have to download and install them on their smartphones or tablets to start playing for fun or real money. Support for South African players is available through the toll-free number 0800-9830-80. Players can also send an email to help@springbokcasino.co.za. If they sign up right away, they will receive three bonuses on their deposits up to R11500.